Topper Manufacturing of Sturtevant, WI now has an outstanding veteran's product available at a very reasonable cost. The product is a metal service plaque, with the branch of service name and emblem cut into the plaque. Each plaque is 15 inches in diameter, weighs 3.5 pounds and is finished for display inside or outside. 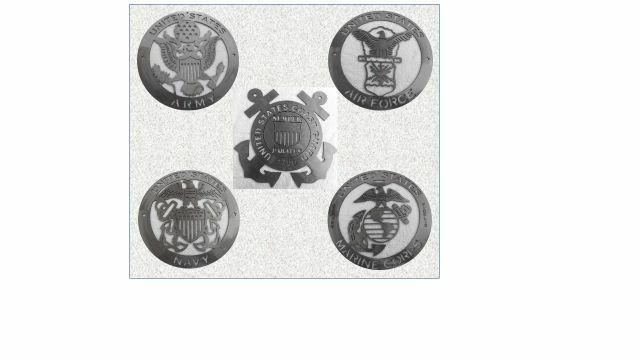 They are available for each of the five major branches of service: Air Force, Army, Coast Guard, Marine Corps, and Navy. The plaques are cut from structural steel sheets and are clear powder painted. For outside display, it is recommended that the plaques be clear coated annually. The designs are by Brown-Donkey Designs, co-located with Topper Manufacturing. Plaques are $30 each plus UPS shipping costs. There may be a savings when ordering in quantity and for repeat customers. VFW Post 8514 has placed 3 orders for a total of 70 plaques for its members and friends and the cost was significantly less. These service plaques are impressive. If this is something that you, your family or your Post would like, you will not be disappointed. And you would be supporting a local Wisconsin business. Contact Topper Manufacturing, phone: 262.891.4750. Mailing address is: 1727 NE Frontage Rd, Sturtevant, WI 53177. Information courtesy of Rollie Colby, Post 8514 Quartermaster.